The Beckman Avanti J-30I Refrigerated Centrifuge provides high throughput processing, with fast separations and versatile applications. This floor centrifuge has a 4-liter capacity, and features acceleration and deceleration rates to match your needs, so your samples spend more time at full force for a quick return. 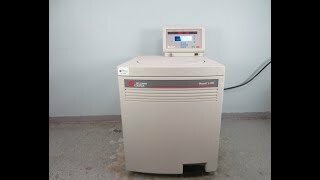 The J-30I has near ultracentrifuge capability with high performance g-force up to 100,000 x g and speeds up to 30,000 RPM. The fast and efficient design of this refrigerated centrifuge mean low heat out put and low energy consumption, and quiet operation at <57 dBA. This high-speed centrifuge has temperature range of -20° to 40°C, features CFC free refrigerants, a friction reduction system, digital control, automatic rotor identification, and an imbalance safety check. From the up top control, users can input their parameters such as speed, temperature, and rotor type, as well as choose to operate a continuous run, quick spin or their desired time between 1 min up to 99 hours and 59 minutes. This control panel on the J-30I also provides at a glance status read outs so you can monitor conditions quickly. This Beckman Avanti J-30I Refrigerated Centrifuge has been fully inspected and is ready to ship. All of our lab equipment comes backed with our standard warranty. Should you have any questions, or need help finding the right refrigerated centrifuge for you, please let us know.